Special fundraising edition of It’s Your Round! – book now! Join quiz mistress and pub landlady Pat Pinch and her lively bar girl Liberty Belle as they take over the renowned theatre pub The Rosemary Branch in Hoxton, East London with live music, Northern prizes, audience participation, raffle and, of course, a few drinks! This event is a fundraiser for Scary Little Girls to help us put on a full-blown play at the magical Minack Theatre, carved into the cliffs of Cornwall. It’s an all-female adaptation of Dracula booked for September: we’re hoping to use the Minack shows as a springboard for a national tour – but we need money to make this happen! The Rosemary Branch is helping us out by lending us their space for It’s Your Round! – all proceeds will go to SLG, so you can have fun while helping us make great theatre! 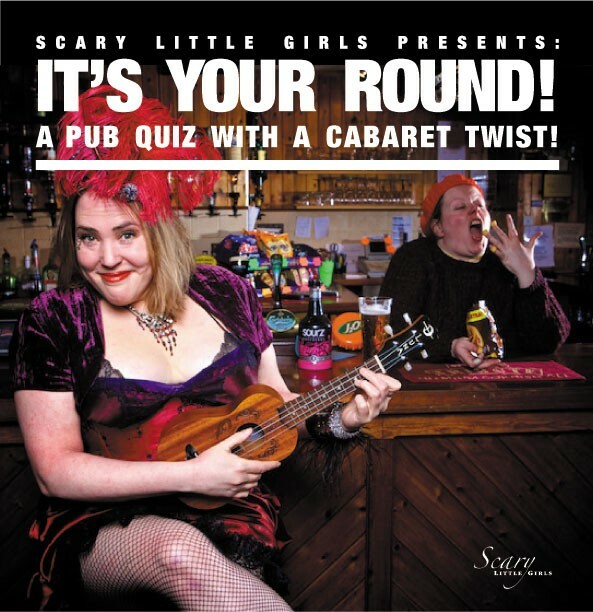 Tickets for It’s Your Round! are £10, to book please contact bookings@scarylittlegirls.co.uk. Performers […] are a good double act… and are very comfortable bouncing ideas off the crowd.